Let’s take a look: Having the right cleat for your position and style of play is important. To get that perfect pair, you need to be able to understand the anatomy of your football boot. What is the need for different studs? What’s the difference between a midsole and an insole? For football boot designers, this is their bread and butter, but beginners may scratch their heads at these questions. 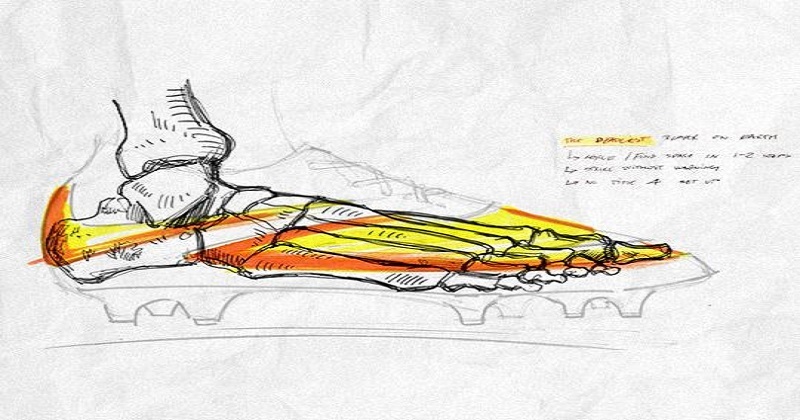 Here’s a rundown of the Anatomy of a Cleat: • Upper: This is the top part of the shoe. The material of the upper changes the way the player ‘feels’ the ball when dribbling or passing. This is where the foot makes contact with the ball, different strike zones offer padding to absorb impact whilst others add more control. The more expensive the shoe, the lighter it will be, and the better the control. • Midsole: This is the support centre, providing stability and comfort to the wearer. The midsole keeps the shape of the cleat, even when sprinting at full speed. • Insole: Most modern boots prefer removeable insoles for a truly customisable cleat. Made of lightweight cushioning, insoles provide comfort but don’t provide much shock absorption at entry-level due to the Die-cut EVA liners. • Outsole: One of the most important aspects of the football boot. This is the bottom of the boot where the type of stud will alter the amount of traction you can gain. Fixed or detachable studs in ground, round or bladed types can offer better control for different surfaces: indoor or outdoor. • Heel counter: The counters can be external, or built within the shoe itself and are generally grouped with the midsole. The heel absorbs most of the impact when running and allows you to accelerate quickly. Internal heels are the most comfortable but provide the less protection. Now you know the ins and outs of football boots you will know exactly what to look for when choosing your next pair.